Spain is a country that thrives in the Gin & Tonic world. If you go on holiday to the country, sit yourself at a bar and order a refreshing drink, expect to have it served within a huge balloon glass, or what effectively looks like a fish bowl. Nothing wrong with this by the way, lots of gin, lots of tonic and lots of ice – what more can you ask for! Well your brand of gin for one thing. Being in Spain you try to go on an adventure when it comes to trying the local cuisine, but what stops us from trying the local tipple too? Say for example gin, or more specifically Larios 12. 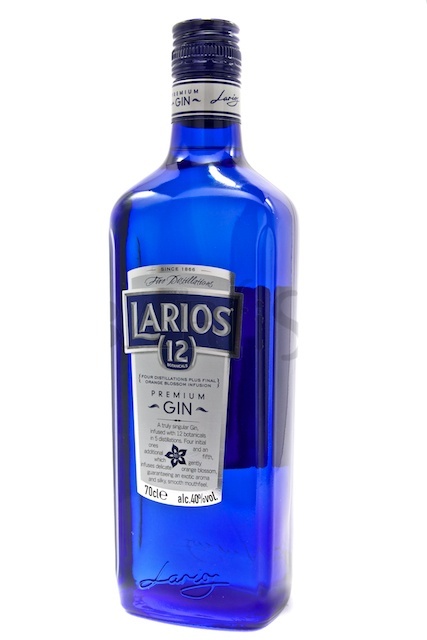 Larios 12 arises from a combination of 12 exotic plant species drawn directly from nature, in five distillations. Juniper, lime, lemon, coriander, orange, grapefruit, mandarin, clementine, tangerine, nutmeg and angelica root are blended together in four distillations, before a fifth which gently infuses the orange blossom. Very soft on the nose with small hints of orange and citrus coming through. Slight sharpness on the palate but instantly mellows. Warmth on the throat that develops into a citrus and spice mix that’s surprisingly smooth. Very long offering. Mix the gin, lemon juice and elderflower in a tall glass with ice, top up with soda water, garnish with a lemon slice and maraschino cherry and serve. One of the classic cocktails, with a gin that surprises many. Which means only one thing, treat yourself, grab some friends, find some sun and ENJOY!